Congratulations…you are about to purchase the most advanced Negative Ion/Magnet wristband on the market today! The IonLoop Skull and Crossbones Bracelet's silicone band contains our advanced Ion Regeneration Technology which allows helpful ions to be absorbed into the body. The visible technology of two small but powerful magnets on the Skull and Crossbones Bracelet will allow the user to benefit from all the natural effects of magnet therapy while looking good at the same time. 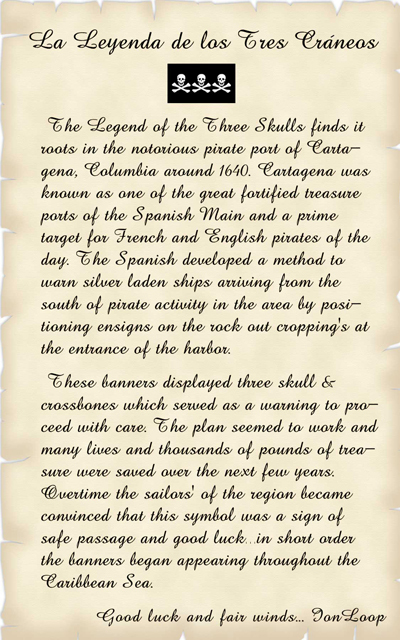 IonLoop became aware of this Legend and has developed an ion bracelet with the very trendy Tres Cráneo figures, or the skull and crossbones as way for loyal customers to display the symbols in the belief that this Legend may in fact actually be true and provide safe travel and good luck.